Wheat paste, commonly referred to as flour paste, rice paste or potato paste, is a simple liquid-based adhesive made from water and vegetable starch. The paste often is used in applying wallpaper and crafts such as book binding and collages. The adhesive is made by mixing equal portions of water and flour. Removing wallpaper or a paper on a craft that has been applied with wheat paste requires a few simple household items. Use a few household items to remove wheat paste from wallpaper and crafts. Fill a spray bottle with water. Wheat paste is water-based. Spraying the paste with water softens the paste, making it much easier to remove. Spray down the wall or surface with wheat paste. The wall should be fairly soaked and covered in water. Allow the water to soak into the paste for several minutes. 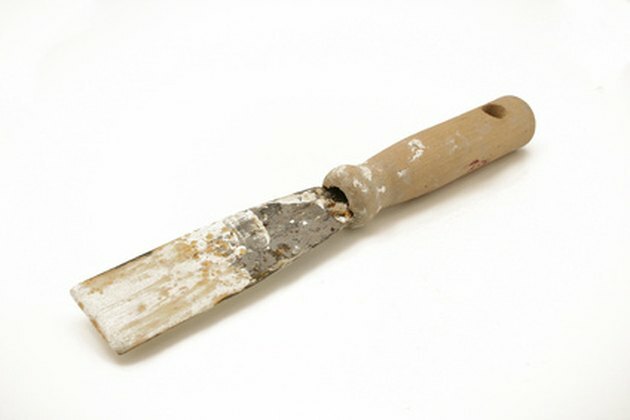 Scrape off the paste using a putty knife or trowel. Continue to spray down the wall with water to soften the paste. Dip a sponge in a bucket of liquid dishwashing soap and water. Wipe the wall using the moistened sponge to remove any remaining wheat paste. How Does Prepasted Wallpaper Work? What to Do If Prepasted Wallpaper Border Won't Stick?